It is a charming coincidence, or maybe more, that the most known and patriotic cross country meet in the state fell on the day 14 years after our country was briefly broken. As the most competitive races of the day were about to begin and the crowd was at its fullest, the nation's colors were ever prominent. 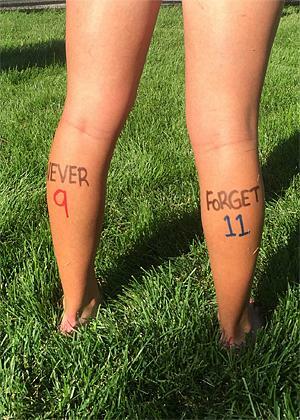 Runners donned support for the fallen with writing on their calves (photo by Ellie Colpitts) and American flags were carried by spectators; what an appropriate day to run your hardest and have no regrets. The Division 1 boys' race was anticipated to be exciting and did not disappoint. First to come roaring through the mile were Isaac Green of Monarch, Jordan Lesansee of Albuquerque Academy, a duo of Steven Goldy and Mason Brevig of Arapahoe, and Byran Hird of Rocky Mountain. The five crossed the finish in the same order, Green with a PR of 15:16 and the fastest time of the day. Although Lesanee had the lead coming around the final bend, Green had the kick and the results show the pair to have the same finishing time. Green admitted to struggling with the race due to the competitiveness of the pack and the speed in which they came out, but still came in wanting to win. 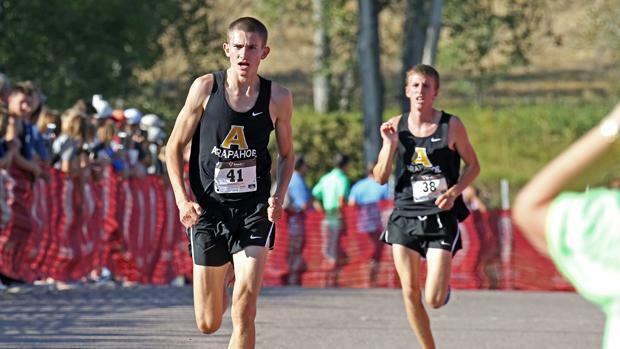 The race for the team title was the tight with only four points between the winners, Arapahoe, and second-place Fort Collins. Arapahoe had a strong 1-2 pack whereas Fort Collins was solid at 3-4-5, but the Warriors were able to come out on top this time. This pair of teams are ranked 1st and 2nd in 5A for state and are separated by two points- which could shape up for a real nail biter in late October! As expected, Lauren Gregory is 2-for-2 in regards to Liberty Bell individual titles. Without a specific time goal and in her season debut, Gregory said she was happy with her race and the chance to "bust the rust" from her legs. After a blazing opening mile last year, Gregory decided to stay comfortable and relaxed for the majority of the race this year, leaving enough gas in the tank to crank out the finish. Despite the graduation of Jordyn Colter, the Cherry Creek girls came out on top of the Division 1 girls' race. A trio of Lisa Swartz, Hannah Mimmack, and Anne Raymond finished 27th, 33rd, and 34th, respectively, to follow up the top ten finishes of Devon Peterson (4th) and Lillian Markusch (8th). The girls said they wanted to finish in the top three and have multiple team PRs, both of which were accomplished, in addition to a tight team pack. Second place Fairview slipped three in between Swartz and Mimmack, and had a 55-second pack time to finish 17 points behind Cherry Creek. Is it another coincidence that the winner of the Division 1 girls' race sports red, white, and blue while they race? In the 5A girls' rankings for state, Cherry Creek has a lonely one point advantage over Division 2 champion Broomfield. Looks like both 5A races will be the ones you don't want to miss when everyone converges at Norris-Penrose!